I think that Solas is going to be a great destination!!! It may not offer the most impressive views of the skyline, but it will bring a lot more people to Glenwood South, assuming they will include some decent destinations. I’m surprised that Solas doesn’t have a website up yet – at least that I could find. It mentions a mid-summer opening. This view will offer some taste of city life with the West Condo building in the background. 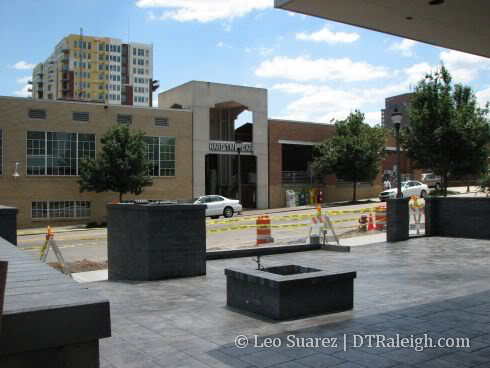 I love the progress Raleigh is making. This also offers a destination location in the city as well. I can’t wait to visit soon. NYC! This place is going to definitely be a destination. Everyone I talk to knows about this project and is looking forward to the roof views from a bar. I think Solas had a great idea and I can’t wait to see this investment paying off. The most recent rumor I heard was a mid June opening – and they’ve spent the last few days unpacking furniture outside. As far as 10+ stories – I thought I remembered hearing that the new Cline Design building across from 42nd would have a 10th floor (ish) terrace area – maybe a bar too? Scratch that – their website says early July. Thanks for the link, Ashton. I also noticed the furniture outside too. I’m excited for this one and hope more developments like this pop up along glenwood. A beer and a view is a killer combination.